When I was researching how to make my One Giant After Eight mint, I came across this on t’internet which I thought was a fantastic idea. 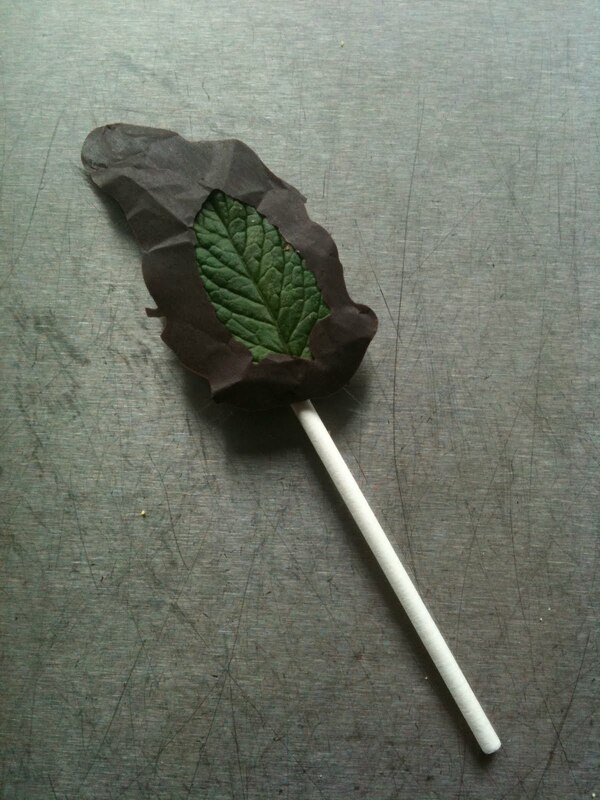 This got me thinking of making other chocolate lollipops. My children like chocolate and I don’t mind them eating it, but prefer them to have good quality dark chocolate which is actually good for you: it’s not easy finding dark chocolate lollies, the choice in milk chocolate whatnot is HUGE, in dark chocolate? Not so much. You can of course also make these chocolollos for adults and serve them after dinner with coffee/instead of a dessert. They are my new BIG NEW THING THAT I’M REALLY EXCITED ABOUT and am pressing chocolate lollies on everyone who comes round. So I decided to get some lollipop moulds to make the process even simpler and because I’m a sucker for gadgets. 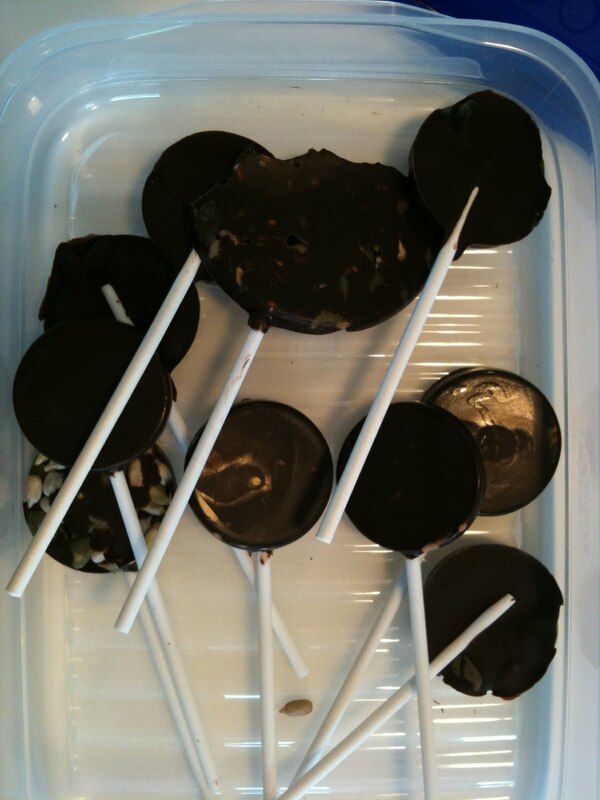 This means you can make a tray of choco lollies in under five minutes and they look so neat and perfect. 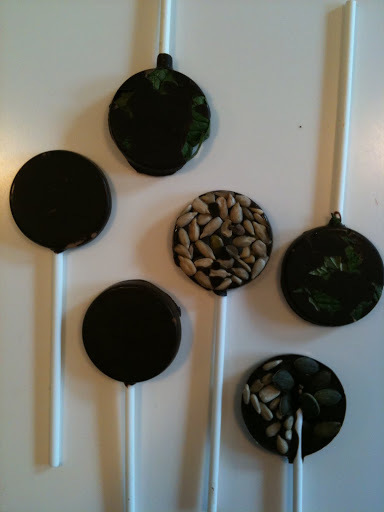 I just melt the chocolate in a jug, in the microwave (about 100g makes seven lollies, roughly), pour them into the moulds, putting in whatever you like – sunflower seeds, pumpkin seeds, chopped nuts, chopped up mint leaves, whole mint leaves, flakes of chilli, bashed up mints or honeycomb. I mean just GO CRAZY. Up to you with whether you put the ‘filling’ in before or after pouring in the chocolate – you get different effects according to which you do. I like it cos it means I can give my children a chocolate hit with omega-3 rich seeds which makes this practically a health food. I got my moulds from Make a Wish Cake Shop, the 7 in one plain one is this one. (Ignore the pic, what you get is a plain tray with seven plain lolly impressions, those funny pics are stick on sugar discs, nothing to do with the mould.) I also got this 4 in one which gives you a much bigger lollipop, only really for special occasions I’d say. Then you need some lolly sticks. There are lots of other places that do lolly moulds/sticks but that’s where I got mine and the service was fast. An update in November 2011. I make these all the time and have experimented with crushed coffee beans (espresso ones if it makes a difference): excellent. But the BIG find was popping candy (I get mine from Waitrose, it’s in the baking aisle, near stuff like sprinkles and cooking chocolate. It’s fantastic, you sprinkle some popping candy (it comes in little rocks almost like crystals) into each mould and pour the chocolate on top. Then, when you eat the candy it ‘explodes’ in your mouth. This entry was posted in Consumer on June 1, 2011 by Annalisa Barbieri. Ooh I've just swooned, they sound fabulous. I'm thinking chopped dried sour cherries that have been soaked in something yummy. Or chopped coffee beans. Or stem ginger. Btw it was me that had all the trouble with my sourdough starter, and I'm ashamed to say that, having just started a new job, any plans for breadmaking have been dropped for now but I'll bore you to tears with it when I'm finally able to put my starter into action. Some great ideas there Karen! I thought of stem ginger too, but chopped coffee beans sound excellent. Mmmm. Good luck with the new job and whenever you're ready to reboot that starter just let me know.